When you walk through the old fashioned gate, colorful tiles around the wall come into your sight. This place used to be a long-established public bath and was renovated for this cafe in 2000. If you have watched “Spirited Away” by Studio Ghibli, you may feel as if you are in the scene of the movie. What we like about this cafe other than the retro and good old atmosphere is that set meals are available even in the tea time. Hence you can enjoy the healthy and tasty set meals anytime you visit this cafe. During the dinner time, you can order vegan food, set meals, a la carte, desserts and more. If you are vegetarian, it may be a good choice to order this bowl of rice! There are cut avocado, tomatoes, salty kelp, and tofu on top of the rice. Sesame oil stimulates your appetite and salty kept goes perfectly well with creamy avocado and fresh tomatoes. As tofu used in this bowl of rice is very soft and mashed, it may be easier to eat with other ingredients. This is one of my favorite cheese cakes in Kyoto! Rich cheese cake matches very well with a caramel flavored whip cream. It is thick but you can eat the whole cake without being full! The cluster is lightly sweetened and we recommend that you put the whip cream when you eat the cheese cake! If you are hungry, this is what you should order! The pork was cut in the big pieces and stewed for long time with special seasonings. It is juicy and a bit sweet which goes well with white rice underneath. Please eat with sliced leak as it makes the taste fresher. Although it looks heavy, you can surprisingly eat it all up! Isn’t it so pretty? Japanese milk-based soft drink called “Calpis” and berry syrup soda are beautifully layered in the glass. It is sweet but the berries on top of the glass adjust the sweetness. We recommend that you order it with your set meals! 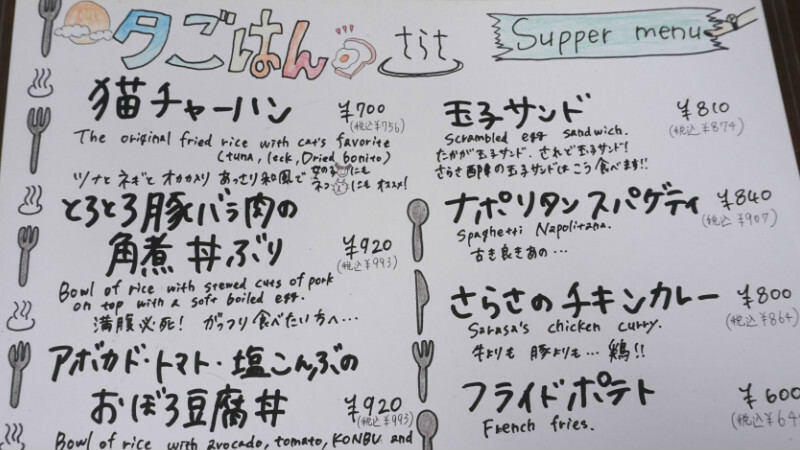 English menu is written under the Japanese menu. If you have any questions, please feel free to ask the staff. We recommend that you order a cake after your meal. They are all very tasty and reasonable. I personally love the relaxing atmosphere in this cafe. You can see that this place was used to be a public bath by the colorful tiles around the walls and the high ceilings. If you watched “Spirited Away” by Studio Ghibli, you may feel as if you are in the scene of the movie. My favorite is a caramel cheese cake as the rich taste of cheese cake goes wonderfully well with caramel sauce. English menu is available and staff speak basic English.